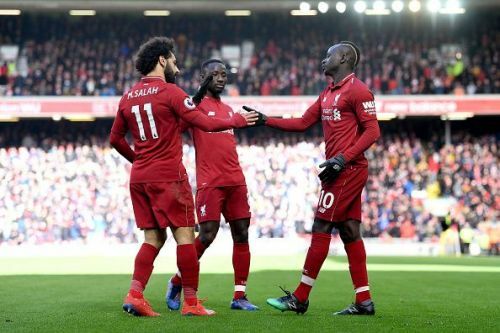 After a disappointing draw against Everton last weekend, Liverpool returned back to the winning ways as they beat Burnley 4-2 in their Premier League fixture at the Anfield Stadium. Ashley Westwood gave Burnley the lead by scoring directly from the corner-kick in the sixth minute of the game but the Reds responded well after going down and equalized through Roberto Firmino in the 19th minute. Sadio Mane put Liverpool ahead in the game during the 29th minute and Roberto Firmino extended his team's advantage to two goals by finding the back of the net in the 67th minute of the game. Johann Berg Gudmundsson gave the Clarets a little bit hope of a comeback by scoring in the second half stoppage time but Sadio Mane scored his second goal of the game during the concluding seconds of the game to secure all three points for his team. Liverpool enjoyed 69% of possession during the game and had 23 shot on goal as compared to Burnley's three. The Reds are currently second in the Premier League table, one point behind the leaders, Manchester City. The Merseysiders are chasing their first league title since 1990 and have lost just one game in the league whole season. They will go up against Bayern Munich at the Allianz Arena for the second leg of the Champions League round-0f-16 tie during the midweek before facing Fulham in the league on March 17. On the other hand, Burnley are currently 17th in the Premier League table, just two points above safety. The Clarets are scheduled to play Leicester City and Wolverhampton Wanderers in the league next. ThE Fa WaNt LiVeRpOoL tO wIn ThE lEaGuE. Liverpool must be feeling the pressure. Firmino looked for his two tap-ins. Romelu Lukaku has scored as many goals in his last 2 games (4) as Mohamed Salah has scored this calendar year. Firmino is the definition of a gunman.